World Breastfeeding Week 2014: Breastfeed Chicago! Public breastfeeding can infuriate us, scare us, make us feel ashamed or empower us. For one Chicago mom, it empowered her to take action and create an organization that would focus on advocating for breastfeeding at a larger level in her city (located in Illinois, USA). She wanted not only to help raise awareness of the benefits of breastfeeding but to ensure that mothers feel comfortable feeding wherever and whenever their babies are hungry. Breastfeed, Chicago! is making changes for Chicago, one mom at a time, through a very talented board of directors that help to put together the group’s advocacy campaigns. I sat down with Katrina Pavlik, the founder of Breastfeed, Chicago!, to find out more about the organization and advice she has for others who want to advocate for breastfeeding in public. We met on a brisk day on the southwest side of Chicago and sat down over some hot coffee to chat about breastfeeding. PATRICIA: Tell us how Breastfeed, Chicago! came to be. I saw a need for a community that could discuss how to make Chicago more breastfeeding friendly. From the Facebook group, we expanded and added the Breastfeed, Chicago! blog and resource list. I wanted to see moms having more of a voice in writing policies. PATRICIA: Chicago and the surrounding suburbs boast a high number of La Leche League (LLL) and Breastfeeding USA groups. What is different about Breastfeed, Chicago!? KATRINA: LLL and Breastfeeding USA are so important. They provide breastfeeding support, which is critical for new moms just getting started. Our organization is about advocacy and policy. We are working to change the view of breastfeeding. We are working on raising awareness, educating the public and advocating for policy changes. PATRICIA: Tell us about the advocacy efforts Breastfeed, Chicago! is working on. KATRINA: One of the big projects we are working on is a letter-writing campaign. One of our board members drafted a letter that we send out to businesses. It basically goes over Illinois breastfeeding laws and gives some information about working with breastfeeding moms. We ask that the information be posted in the employees’ space, such as a break room, so all of the employees from the top down are receiving this information. The letter is also available on the Breastfeed, Chicago! resource list so that parents can print it out and send it to any business that they feel would benefit from this information. We also are working on a sticker campaign. We have printed up Breastfeed, Chicago! window decals that businesses can place on their doors or windows that indicate that this is a breastfeeding-friendly business. We really want this to be mom-driven, so we have these travelling baby cafes in the summer. We meet in different areas around the city, and moms can get together, have a cup of coffee and chat. It’s an opportunity for us to brainstorm ideas that will help make Chicago more breastfeeding friendly. We take the stickers with us and moms can take a stack and hand them out at their favorite businesses, restaurants, et cetera. The blog also has an advocacy tool kit that can be downloaded. It includes information on your rights as a breastfeeding mom in public and at work. 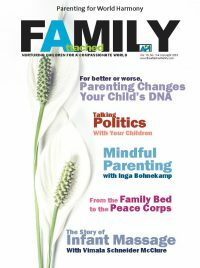 It has tips for advocating for yourself and your child, questions to ask your pediatrician, tips to make breastfeeding in public more comfortable. It also includes a letter that you can send to your birthing hospital to express your gratitude or disappointment with their approach to breastfeeding. And it includes the window sticker and a letter that accompanies the window stickers, explaining the sticker campaign. PATRICIA: I noticed you didn’t mention nurse-ins. KATRINA: Breastfeed, Chicago! has never implemented a nurse-in. We want to circumvent the nurse-in. We want to normalize breastfeeding and implement interventions that will make this normal. Nurse-ins are a tertiary intervention. We are looking at what can we do before that. Nurse-ins also serve to embarrass the individuals involved. Similar to the way we raise our children, we don’t want to punish and embarrass people into change. We want to teach them and educate them into changing their behavior. PATRICIA: What advice would you have for parents in other cities who would like to take on a venture like Breastfeed, Chicago!? KATRINA: Use social media. Moms are online all day everyday. Moms will come together and build community. Once that community it built, moms will start to share their needs. Make sure you are listening, and when a mom brings up a need, step back and contemplate and ask yourself, how do we make this better for all moms? Make sure you reach out to your local breastfeeding professionals. Make them feel important, and ask them to be a part of what you are doing. And be aware that things move slowly.